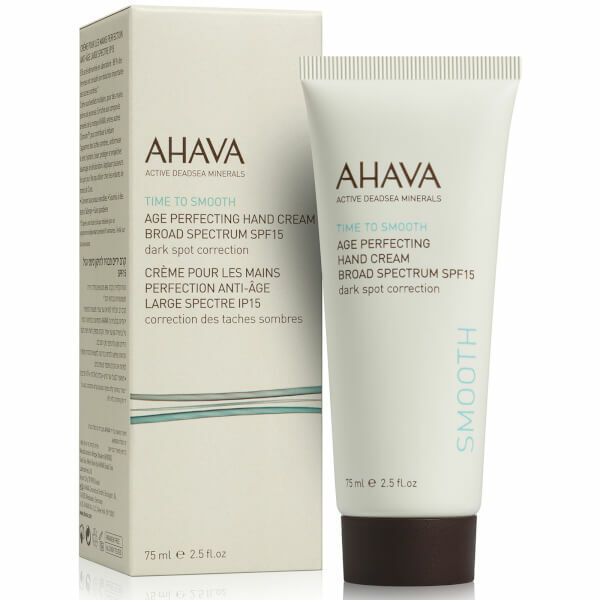 Restore soft, supple skin with AHAVA Age Perfecting Hand Cream SPF 15; a lightweight, quick-absorbing formula developed to address signs of ageing. Enriched with Dead Sea Minerals, the non-greasy cream works to moisturise and hydrate, as it defends against the damaging effects of UV rays and environmental aggressors. Targets dark spots and uneven skin tone, whilst minimising the appearance of fine lines to reveal brighter, smoother hands. Apply a pea-sized amount to the back of hands and massage until absorbed. Avobenzone 3% Octisalate 5% Octocrylene 2.7% Inactive Ingredients: Aqua (Mineral Spring Water), Glycerin, Dimethicone, Butyloctyl Salicylate, Isohexadecane, Glyceryl Stearate, C12-15 Alkyl Benzoate, Peg-40 Stearate, Octyldodecyl Neopentanoate, Sodium Lactate, Stearyl Alcohol, Hydrogenated Olive Oil Cetyl Esters, Sorbitan Tristearate, Ascorbyl Glucoside, Maris Aqua (Dead Sea Water), Phenoxyethanol, Cetearyl Alcohol, Aloe Barbadensis Leaf Juice, Aminomethyl Propanediol, Butylene Glycol, Zizyphus Jujuba Fruit Extract, Salicylic Acid, Parfum (Fragrance), Niacinamide, Xanthan Gum, Dunaliella Salina Extract, Hydrogenated Polydecene, Caprylyl Glycol, Phoenix Dactylifera (DATE) Fruit Extract, Chlorphenesin, Dictyopteris Membranacea Extract, Sodium Citrate, Disodium EDTA, Helianthus Annuus (Sunflower) Seed Oil, Ascorbic Acid, Melissa Officinalis Leaf Extract, Polyglyceryl-3 polyricinoleate, Methylpropanediol, Citrus Reticulata (Tangerine) Peel Extract, Polyglycerine-3, Pentylene Glycol, Myricetin, Scutellaria Baicalensis Extract, Porphyra Umbilicalis Extract, Opuntia Ficus-Indica Fruit Extract, Helianthus Annuus (Sunflower) Sprout Extract, Pentaerythrityl Tetra-di-t-butyl Hydroxyhydrocinnamate, Pseudoalteromonas Ferment Extract, Commiphora Abyssinica Resin Extract, Citric Acid, Diisobutyl Adipat.